It’s chartreuse in the hollow, all yellow-golden green. The frogs sing in the evenings and the creek gurgles just as it did when I first came here many years ago. Since then we’ve known seasons so dry there was nary a sound, so we rejoice in a prolonged, cool, wet season with sounds of splashing all around. Tomatoes not in ground yet, nor have sunflower, cleome or zinnia seeds been sown. This is a good year for the lazy gardener as it’s still so cool. They say the 17-year cicadas won’t hatch out until the soil temp is 64 degrees. Have had a great spinach and lettuce/greens crop and the strawberries are just starting to fruit. So full of water, the rain has been good for them. 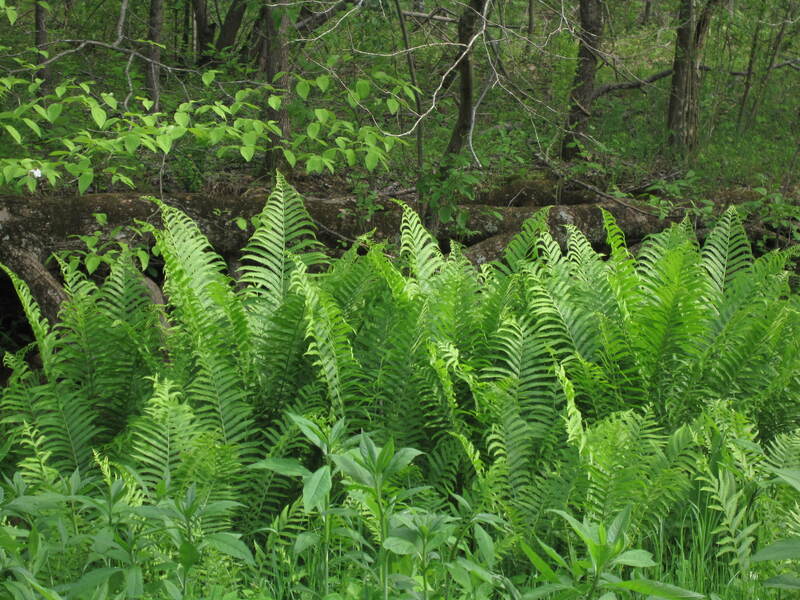 The Ostrich ferns (Matteuccia struthiopteris) are particularly nice, very high this year, at least 4 feet. They spread beneath the walnuts and the old autumn olives, never bothered by the deer and with nice brown fronds over winter. Nice gardens and love the ostrich ferns. We have alot of these ferns around our area and mine I got inthe front garden are doing weell this year. It’s all the extra rain we have had. I see you grow the climbing roses too, I got rid of my climbing roses, they didn’t do well at all. I have since planted several bourbon rose bushes. The bourbon roses have the best fragrance.